Dr Krishan Bir Chaudhary, president of Bharat Krishak Samaj, India’s largest farmer organisation, and Ali Tapsoba de Goamma, from Burkina Faso, founding member of TERRE A VIE and Coordinator of the International GMO Resistance Meetings (RIR-OGM) share the experience of the effect of BT Cotton cultivation in their respective countries. As Dr Vandana Shiva argues “the main reason corporations like Monsanto push GMOs like Bt cotton on us is to make super profits through the collection of royalties”. Unfortunately profits cannot always win against nature, for this reason Bt cotton has enormously failed in its mission. Monsanto was advertising Bt cotton “as a crop that would make huge profits for farmers because it would reduce their input costs by slashing their pesticide use and be a boon for the environment” [ Seed swaraj (Seed Sovereignty], By Dr Vandana Shiva, The Asian Age, 22 March 2016]. These promises have failed soon, indeed while Bt cotton yield are deeply falling, the amount of pesticides and fertilisers are enormously increasing. Looking at the Indian case, through the collection of royalties Monsanto has overtaken Indian law and has created a seed monopoly in the country. The impressive wave of farmers’ suicides occurring in the Indian Cotton belt in the last decades is due to the fact that this monopoly have had a huge impact on the increase of seeds price, leading farmers in debt and with no profit from their harvest. In October 2015, Navdanya traveled to the cotton growing Malwa belt of Punjab to report the damage done by the whitefly on Bt cotton. This was just one of the steps of the ongoing campaign in support of the farmers victims of Bt cotton failure. Navdanya continued sending teams on regular basis to the affected areas, village by village, to both distribute native cotton seeds to the farmers and to organise meetings with the population [Navdanya Campaign in support of farmers victims of BT Cotton failure]. While in India there is a war on seed prices between the government and the illegal system constituted by Monsanto, a similar situation happened in Burkina Faso. Also in the African country Monsanto introduced the GM cotton seeds, but the determination of civil society and farmers to oppose the U.S. corporation aim to control Burkina Faso agricultural system was impressively cohesive. For this reason Burkina’ s cotton producers decided to stop Bt cotton [Burkina Faso abandons GM cotton, By Theresa Krinninger — Deutsche Welle, 28 June 2016]. Dr Krishan Bir Chaudhary: “It all began in ’98, liberalisation driven policies opened up our economic systems, did start the field trails of Bt cotton and in 2002 it was planted in Indian farmers fields. They at the time “promised” that the productivity of farmers’ fields will increase and it(Bt cotton) will reduce pesticide use. At that point we(farmers) were spraying 20 and more with pesticides and Monsanto claimed the spraying will stop and also the Bt cotton will be able to counter the bollworm. But both these claims were a deception and a lie. Monsanto has fooled Indian farmers. Now if I tell you about production, in 2005 when land under Bt cotton cultivation was only 5% and about 95% was of our own traditional varieties of cotton seed, which gave about 471 kg/per hectare. We know the 2014-15 figures and it is not above 483 kg per hectare and the input costs have increased six fold, starting form the seed to the other external inputs costs(spent on fertilisers, etc). It is to note that there has been only an increase of 3% in terms of the yield. But this also is because of the better irrigation facilities promoted by the government and it has nothing to do with the seed(Bt cotton). Monsanto wants the devastation of the Indian farmers. They violate Indian laws and if we pay attention to the Plant Variety Protection and Farmers’ Right Law, made by Indian parliament, patents on seeds and animals are not allowed and no one can charge a royalty on them. But Monsanto using the “technology trait fee” clause has illegally collected Rs 50,000,000,000 as royalties from poor Indian farmers. 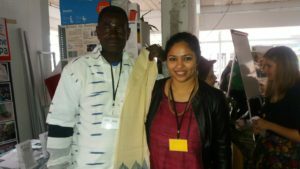 Ali Tapsoba de Goamma and Lilia Ghanem with Navdanya’s Fibres of Freedom, fibres grown and woven from non-GMO, native, organic cotton of India. I have asked the government of India to make sure the Monsanto gives back this money back to the widows & children of the 300,000 Indian farmers who have committed suicide because of Monsanto’s seeds of suicide, Bt cotton. Recently in Haryana and Punjab Rs 70,000 crore worth of cotton crop has been destroyed. 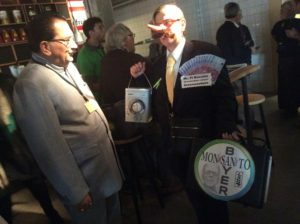 The way whitefly has attacked, together with way Bayer has used this event to sell its pesticides, it is all a plot of the corporations to control the market and create monopolies. The whitefly did not attack cotton, but because of Monsanto’s seeds the whitefly has started to attacking cotton. It is the same case with Parthenium weed that came to India concealed in the wheat seeds to India. Today we have sent thousands of crore on pesticides etc trying to combat this problem, but with no success. I will give one last example, in my home state of Uttar Pradesh once agains the farmers have been mislead by Monsanto. They have lost all their Bt cotton crop and are now uprooting it. They have began planting potatoes after a failed harvest. Monsanto has a history of spreading destruction. They only have one motive that is to enter the food and farming world in the name of technology, because they want to capture the food sovereignty and food systems. Seed is the strongest weapon to capture this system. They have done the same in the developed worlds, where only 6-7 corporations control everything. The same corporations want to control the food systems here, using seeds and patents. They are using technology just as a medium but the technology they are talking about is a fraud. What they are doing is unnatural and artificial. We have to adopt ways that have sustained Indians for thousands of years. Their technology is not only bad for human health, but for animals for our environment alike. Ali Tapsoba de Goamma: “My name is Tapsoba Ali. I’m a human rights activist, president of Terre à Vie, spokesperson for the citizens’ collective of agro-ecology. In Burkina Faso, we’re engaged in a battle against GMOs for many reasons. 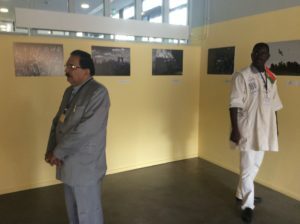 Firstly, GMOs entered our country due to a political lie born from as a deal between Blaise Compaoré – which we chased away – and the American government. They lied to us, saying that our cotton was having issues, and we mobilized ourselves and started to fight back, advocate, march and conduct numerous meetings. When we managed to chase away the president Blaise Compaoré, Monsanto felt weak. With the citizens’ collective of agro-ecology, we organised a march last year, during which we said “Monsanto, out!”. Nowadays, one can see that Monsanto has effectively failed because the cotton Burkina is selling is no longer GMO cotton. Even the producers refuse to sell it. They had the courage to do so thanks to our fight, the fight of activists, thanks the fight of society at large, thanks to the fight supported by Burkina researchers and the people of Burkina’s financial support. We inform you today that the producers of cotton claim over 50 billion in compensation from Monsanto because they realised Monsanto cheated them. 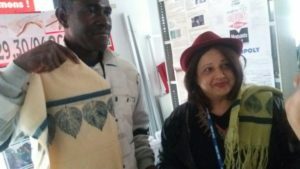 Recently, Burkina’s cotton producers have decided to stop making GMO cotton and Monsanto has seemingly broken off its contract. The message we’d like to share with the world is that Burkina Faso is a concrete example of the failure of GMOs. We cannot imagine that today, after what they have seen in Burkina Faso, a country would still dare to engage in GMOs. What we would like to say is that there are still multinationals that want to control our food. We tell you, he who fights against the seed, controls production, he who controls production will control our food, and he who controls our food, will control our way of thinking. To govern our way of thinking is a global governance that will bring us to slavery. Dr Krishan Bir Chaudhary was a witness at the Monsanto Tribunal during the session “Impact on farmers and the right to food”. 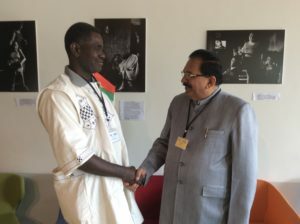 Ali Tapsoba de Goamma was in The Hague with a full delegation from Burkina Faso. 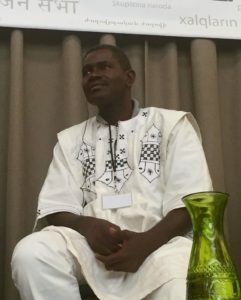 He took part in the People’s Assembly session “Attack on farmers and farming” while his colleague and farmer Ousmane Tiendrebogo was a witness at the Monsanto Tribunal session “Impact on farmers and the right to food”. The TRibunal against Monsanto is a very good initiative. My hope is Monsanto stopps his crimes against the humanity.